BBC NEWS | Middle East | Analysis: What went wrong? The collapse of efforts by the United States and Britain to get clear Security Council support for a war against Iraq is the most serious diplomatic failure in a long time. And yet late last summer, when they embarked on the United Nations route, it had looked promising. Both governments produced dossiers that provided evidence that Iraq had begun to make chemical and biological weapons again, and had even restarted its attempt to make a nuclear bomb since the departure of weapons inspectors in late 1998. After lengthy negotiations, the Security Council passed by unanimous vote a demand that Iraq disarm and co-operate with the inspectors. Then it began to go wrong. It turned out that resolution 1441 was subject to differing interpretations. Britain and the United States said that it by itself allowed for military action but France and Russia, joined by Germany, said that it did not. Resolution 1441 proved to be a fudge, not a formula. Washington and London then made a big mistake. They underestimated the French. France not only believed that inspections were working. It suspected the Americans of simply wanting council backing for regime change in Iraq, and saw the American approach as symptomatic of their new hegemony and something that had to be challenged. Britain made another mistake in pressing for a second resolution. This was something Tony Blair felt he needed to head off domestic criticism. He unwisely predicted success. The Americans went along with him grudgingly. The French roadblock proved impassable. Then those dossiers began to fall apart. The British dossier had contained an alarming claim that Iraq had tried to acquire uranium from an African country despite not having a civilian nuclear programme. The UN inspectors managed to establish that the claim was based on forged documents. Collapse of case. Another suspicious consignment of thousands of aluminium tubes, thought to be for uranium enrichment, was accepted by the inspectors to be for the manufacture of rockets. Then another document produced by the British Government about the evils of Iraqi President Saddam Hussein turned out to have been based on a student's thesis. The thesis was not necessarily wrong, but it had not been credited. Collapse of document. Most damaging of all, the inspectors made progress and did not find any of the weapons of mass destruction the dossiers had said were there. Even a presentation by the US Secretary of State Colin Powell to the Security Council proved unconvincing. He produced photographs and even audio tapes, but failed to make a decisive impact. Nor did he convince everyone that there were links between Iraq and al-Qaeda. Mr Powell's overall performance has not impressed in Washington. He did not appear to throw himself into the fray, failing to travel much, even though votes and support were urgently needed. He failed to get Turkish approval for the use of bases there for an invasion from northern Iraq. And throughout all this, the inspectors were not finding illegal ammunition. Instead they were giving political ammunition to France and the other critics by reporting some progress. The French logic was that inspections should therefore continue. 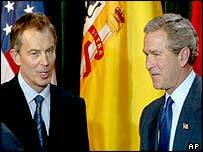 In vain did Britain and the US argue that Saddam Hussein could not be trusted. Nor could they dispel the suspicion that the timetable was being driven too much by the need to use the troops which had gathered in the Gulf. The American hawks will feel they were right all along. The UN route would be blocked, they predicted. It has been. "That resolution never had a chance of a majority vote in the UN, with or without France"